Vision Zero uses data to target improvements that will reduce crashes, save lives, and address inequities experienced on the street related to crashes. An average of 11 people were killed and 84 experienced life-altering injuries on streets in Minneapolis each year between 2007 and 2015. These injuries and deaths are disproportionately suffered by people walking and bicycling, in neighborhoods with lower incomes, and by Native Americans. 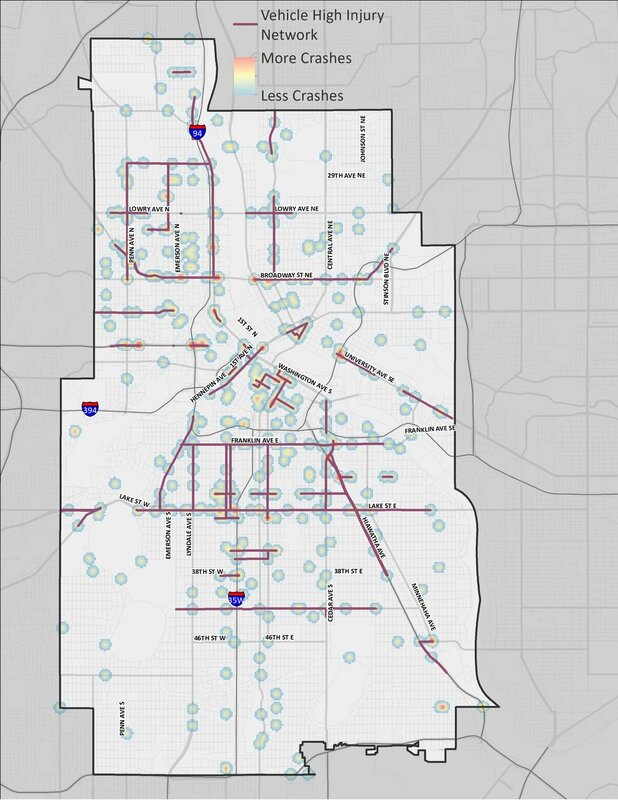 In Minneapolis, crashes and injuries are concentrated on a small percentage of streets, often ones that have a high demand for walking, biking, transit, and driving. Many crash concentration corridors are on four-lane undivided streets without dedicated turn-lanes. Streets with higher speed limits generally have a larger share of crashes and severe crashes. The City of Minneapolis has recently completed crash studies to understand trends to inform our Vision Zero work. Key facts from our crash studies are listed below. Click the graphics to expand the image. Nearly every street in Minneapolis with a high concentration of severe traffic injuries and deaths for all modes is a street with two lanes in each direction, generally without dedicated turn lanes. These include segments of streets like Lake Street, Franklin Avenue, Hennepin Avenue, and Broadway Street Northeast. Regardless of how you travel in Minneapolis, most crashes occur at intersections. 89% of vehicle crashes, 78% of pedestrian crashes, and 80% of bicycle crashes occur at intersections. Additionally, while only 12% of city intersections have traffic signals, many vehicle (57%), pedestrian (52%), and bicycle (48%) crashes occur at signalized intersections. 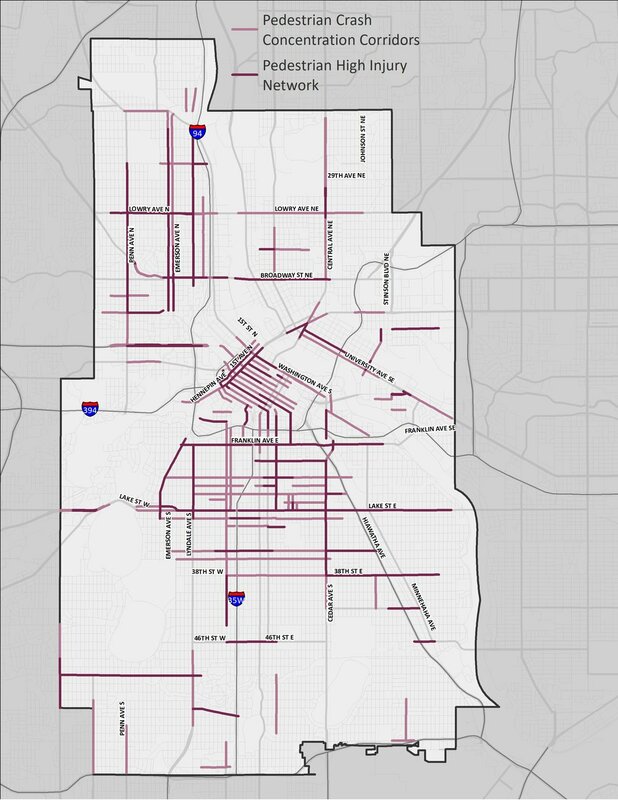 While 31% of Minneapolitans live in census tracts where there are larger shares of people with lower incomes and over half of residents are people of color, 42% of pedestrian crashes, 40% of vehicle crashes, and 35% of bicycle crashes occur in these neighborhoods. Pedestrian crashes on streets with a speed limit of 25 mph or less were less likely (6%) to result in a severe injury or death than streets with 30 mph speed limit (9% likelihood), 35 mph speed limit (16% likelihood), 40-50 mph speed limit (23% likelihood), and 55 mph speed limit (14% likelihood). Pedestrians are not often on highways with 55 mph speed limits in Minneapolis, so the nature of those crashes is different than other streets. People in Minneapolis make 18% of their trips on foot, but pedestrians are 28% of severe traffic injuries and deaths. People in Minneapolis make 5% of their trips by bicycle, but bicyclists are 16% of severe traffic injuries and deaths. The share of traffic-related severe injuries and deaths borne by people walking has increased in recent years. 36% of all crashes happen on 2% of our streets, and 15% of all severe or fatal crashes occur on just 1% of our streets. Corridors that have high rates of injurious or fatal crashes, regardless of how you travel, are sections of: Lake Street, Franklin Avenue, Lyndale Avenue South, Hennepin Avenue, Broadway Street Northeast, Central Avenue, Cedar Avenue, Lyndale Avenue North, and 28th Street. The leading unsafe behaviors on Minneapolis streets are: red light running, speeding, driving under the influence of alcohol or drugs, unsafe turning, and distracted driving. Traffic deaths and severe injuries are concentrated on relatively few streets, which we refer to as the High Injury Network. Understanding where severe injuries and deaths are concentrated will help us create strategies to make these streets safer. Click the maps below to expand the image. The Pedestrian high injury network also includes a number of streets in downtown. Our full Pedestrian Crash Study and Vision Zero Crash Study, which analyzes vehicle and bicycle crashes, provide additional findings from our analysis of traffic crashes between 2007 and 2016.